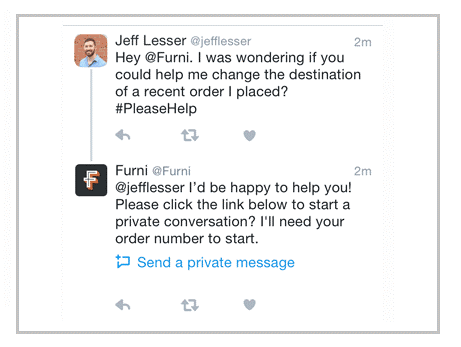 Twitter has launched two new social customer service features which will have an impact on brands – Tweets to Direct Messages and Customer Feedback. While both relatively small changes, together they show Twitter’s intent to take social customer service seriously. In the official announcement on the Twitter Advertising blog, the platform cites some of the largest customer engagement platforms – including Lithium (a sponsor of SCSS16) – as official partners for it’s customer service features, demonstrating a more holistic view of the Twittersphere than has sometimes been the case. So, what are new features? As the title suggests, Twitter has added a short-cut to sending a direct message by providing the option of adding a button below a Tweet which jumps a user straight into a private, direct message (see image above). This is likely to encourage more customers to engage with brands privately via Twitter and, combined with the removal of the 140-character limit on Direct Messages (implemented in August 2015), makes Twitter a viable service alternative for resolving quite complex service issues. It may also compete with Facebook’s push to make it’s Messenger platform the default customer care channel of choice. 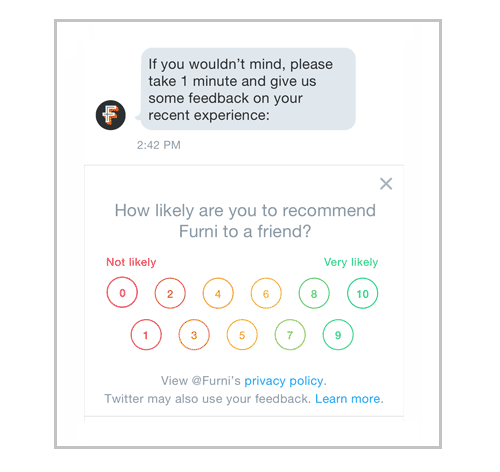 One of the challenges with Twitter is that it doesn’t offer the ability to get structured feedback from customers, making Net Promoter Score (NPS), CSAT, Gratitude Index or any other measurement framework difficult to implement. Twitter is rolling out the ability to embed feedback forms in Tweets, to gather simple but structured information from customers (see above). The feature will only be available to certain brands to start with, but is expected to be rolled out more widely in due course. We will be discussing the implications of these updates along with a full review of all the latest developments in social customer service strategy at the Social Customer Service Summit in London on 13/14 April. Tickets are on sale now.